NEW YORK, N.Y. -- Attorney General Barbara D. Underwood today announced the conviction of Franklin S. Marone, 55, of Queens, NY for multiple schemes to defraud – including falsifying financial disclosures to avoid paying restitution to victims from a $5.4 million securities fraud scheme in which he was previously convicted, and stealing over $360,000 from his now 89-year old mother, multiple ex-girlfriends, and a military veteran. Marone's combined sentencings in Greene County Court and Queens Supreme Court will result in a total state prison term of 10 1/3 to 29 years. Marone was also ordered to make reparations in excess of $1.5 million. Today, Franklin Marone was sentenced by Honorable Terry J. Wilhelm in Greene County Court to 2 to 4 years in prison for submitting fraudulent financial disclosures to conceal his assets from the court in order to avoid paying restitution to the victims of his $5.4 million securities fraud scheme for which he was convicted in 2004. In June 2018, Marone was resentenced to 8 1/3 to 25 years for willfully failing to pay restitution – a violation of the terms of his prior 2004 sentence. Today's 2 to 4 year sentence for perjury and false filings will run consecutive to Marone's resentencing of 8 1/3 to 25 years, resulting in a total state prison term of 10 1/3 to 29 years incarceration. In a separate scheme in which Marone stole over $360,000 from his now 89-year old mother, multiple ex-girlfriends, and a military veteran, Marone pleaded guilty last week in Queens Supreme Court to one count of Grand Larceny in the Third Degree (a class "D" felony) and one count of Scheme to Defraud in the First Degree (a class "E" felony). The Honorable Barry Kron sentenced Marone to a total of 2 to 4 years, to run concurrent with his sentence on his Greene County convictions. "After previously being convicted of fraud, the defendant has shown zero remorse for his victims – and a complete disregard for the law," said Attorney General Underwood. "No matter how covert or complex the scheme, my office will continue to work with our law enforcement partners to root out fraud and protect New Yorkers from financial exploitation." New York State Police Superintendent George P. Beach II said, "This individual stole millions from his victims, including his own mother and showed no remorse throughout. I commend the work performed on this case by our investigators and our partners in the Attorney General's office. This case serves as a reminder that those who seek to defraud others, especially when they are in a place of trust, will be prosecuted to the fullest extent." According to statements made at sentencing, over the past two decades, the defendant financially exploited over 30 victims, including but not limited to: friends, co-workers, girlfriends, military veterans, and his own 89-year old mother. Prosecutors described Marone as a charismatic predator who befriended others and then used them for financial gain. Instead of making meaningful efforts to repay his prior victims, Marone continued to defraud additional victims, and then deliberately concealed his ill-gotten gains from the court. Between November 1998 and January 2004, Marone, a former stockbroker, targeted his fellow members of the ski patrol at a Catskills mountain resort and fraudulently solicited them to invest over $5.4 million in a series of fictitious equity funds that he dubbed "Patrollers Capital Funds." In furtherance of his scheme, Marone created fraudulent stock certificates, prepared phony account statements, and sent emails to his victims touting the performance of the phony funds. In reality, all of the investors' money was deposited directly into Marone's personal accounts. On June 22, 2004, Marone was convicted in Greene County Court of two counts of Grand Larceny in the First Degree (a class "B" felony) and one count of Scheme to Defraud in the First Degree (a class "E" felony) for perpetrating a massive investment fraud scheme. Marone was sentenced to 6 to 18 years in state prison and ordered to pay over $4.6 million in restitution to his victims. Marone began missing his court-ordered restitution payments after he was released from parole in early 2014. After continued failure to make timely payments, the Honorable Terry J. Wilhelm of Green County Court ordered a restitution hearing and directed Marone to complete financial disclosure affidavits. In July and August 2017 – in an effort to conceal his assets and income and to avoid paying restitution – Marone filed two financial affidavits with the court, attesting that he had no assets and minimal income. On June 11, 2018, a restitution hearing was conducted before the Hon. Wilhelm, resulting in a finding that the defendant had willfully failed to pay restitution to his 29 prior victims. The court heard evidence that the defendant only paid a total of $15,000 restitution between 2013 and 2017, while simultaneously: receiving in excess of $55,000 in checks payable to himself or cashed on his accounts; spending over $64,000 in upgrades to Jeep Wranglers for customized oversized tires, wheels, a light bar, and other equipment; spending over $18,000 for a gym and spa membership; spending over $4,000 on a cruise; and pawning over $9,000 worth of property. On June 21, 2018, Marone was resentenced to an indeterminate term of imprisonment of 8 1/3 to 25 years in state prison for his willful failure to pay restitution. The court further ordered that the defendant's prior $1.2 million restitution order remain in place, so that his victims may receive compensation in the future. Also on June 21, 2018, Marone entered a guilty plea to two counts of Offering a False Instrument for Filing in the First Degree (a class "E" felony) and two counts of Perjury in the Third Degree (a class "A" misdemeanor) for filing false affidavits with the court concealing his assets and income. Today, Hon. Terry J. Wilhelm sentenced Marone to 2 to 4 years in prison, to run consecutive with his resentencing – bringing his total sentence to 10 1/3 to 29 years in state prison. Between January 2014 and September 2017, Marone stole over $360,000 from multiple victims – including his 89-year old mother. Moreover, between May and June 2016, Marone impersonated his mother in a series of recorded phone calls with a financial institution, in an attempt to steal over $50,000 from her account. Marone also targeted and stole over $45,000 from an ex-girlfriend and a family friend. Marone used the stolen money to purchase Jeep Wrangler upgrades, cruises, and thousands of dollars in premium gym memberships for himself, his current girlfriend, and their respective families. On July 12, 2018, Marone pleaded guilty in Queens Supreme Court to one count of Grand Larceny in the Third Degree (a class "D" felony) and one count of Scheme to Defraud in the First Degree (a class "E" felony). The Hon. Barry Kron sentenced Marone to a total of 2 to 4 years, to run concurrent with his sentence on his Greene County convictions. Marone also had confessions of judgment entered against him for the full amount of his theft from the Queens County victims. Attorney General Underwood thanks the New York State Police Financial Crimes Unit for its valuable assistance in this investigation. 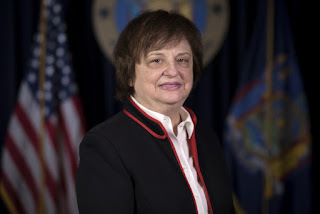 The case is being prosecuted by Assistant Attorney General Philip V. Apruzzese of the Attorney General's Criminal Enforcement and Financial Crimes Bureau, with the assistance of Legal Support Analyst Rebecca Jacobson. The Criminal Enforcement and Financial Crimes Bureau is led by Bureau Chief Stephanie Swenton and Deputy Bureau Chief Joseph D'Arrigo. The Division of Criminal Justice is led by Executive Deputy Attorney General Margaret Garnett. The OAG investigation was conducted by Investigator Mark Spencer, under the supervision of Deputy Bureau Chief Antoine Karam. The Investigations Division is led by Chief Investigator Dominick Zarrella. Audit work was performed by Auditor Investigator Marcos Perez of the Forensic Audit Section. The Forensic Audit Section is led by Deputy Chief Sandy Bizzarro and Chief Edward J. Keegan.